Having a restaurant that offers delicious food and successfully established your food business online too? Great! But do you think that it is enough to get potential customers and grow your business? Of course, the answer is a big NO. In today's time, there is fierce competition among restaurant business. Not moving in the right direction might lead to the failure of your business. It is therefore very important to opt for the right marketing strategies. Thus, if after your great efforts you are still lacking behind then it is the time to look forward and opt for more advanced ways to popularize your dishes and your restaurant strategies. We have created a list of tasks that you can use to promote your restaurant business and grab attention from growling stomachs everywhere. With the growing use of the Internet in today's world, social media platforms are not lacked behind. It proved to be beneficial in the promotion of product and services. A good social media platform is the voice of your brand and is a highly engaged machine that helps in building great content. A strong social media presence fare the best in the competitive food industries. There are many different social media platforms but for food, Instagram is considered as the king, Facebook as the queen and the rest of the platform as puns. So the right utilization of the sites by posting top-notch food pictures, video clips etc can help you in churning a great profit. Although creating a website seems to be a tedious task but getting your own business website gives far much better output than your inputs. A good website is proportionate to a food shop that becomes popular in every part of the world. An efficient website is capable of building your business big and in creating a much larger market of consumers. While creating a website, make sure that it is attractive, has great content, has less loading time, and is responsive. Creating a responsive website does not end the task, it is equally important to keep updating the information and posting new and worthy blogs. A good blog helps in strengthening your authority, thus increasing your visibility on the Internet, updating your potential customers about the things that are new at your restaurants, influencing them and conveying them the reason of why they should order food from your restaurants, and gives people a platform through which they can interact with you and let you know about their likes and dislikes in your services. While writing a blog, make use of catchy headings, powerful images, and proofread the content before making it live. Get your business included in the online food apps. This works as the most powerful and effective restaurant marketing plan. It encourages your potential customer to check out your restaurant through customer loyalty programs. These programs offer certain discounts and free meals on visiting your apps for a certain number of times. Thus, it influences more and more customer to reach you and to try your dishes. This increases the probability of your growth and helps you in moving ahead of your competitors. 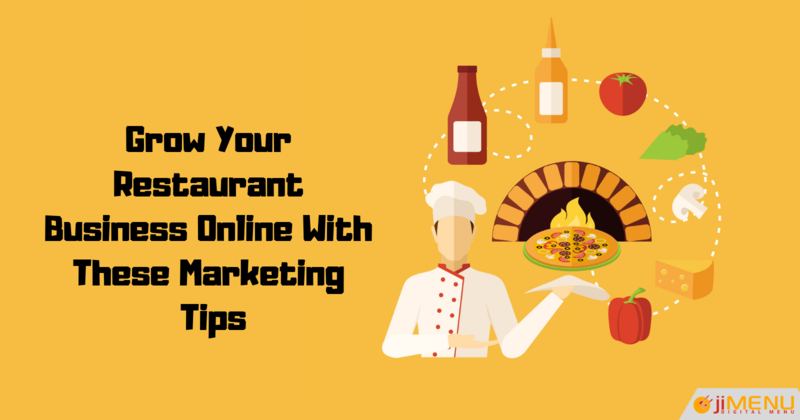 The other vital and effective strategy of marketing your restaurants is email marketing. Since the world is growing digitally, it is, therefore, good to grow your email list by getting your customer to fill online forms. The email marketing platform has proved to be the best way to attract your potential customers and to encourage them to revisit your site. Also, you can help your customer know about the updated list of new dishes and offers. A poor online reputation can become the reason to destroy your restaurant business. It is therefore very important to pay special attention to maintain an online reputation. A good online reputation management strategy involves a quick response to the customer queries and acknowledging both positive and negative reviews in a way that represents a good image of your restaurants. If you are looking for a change and want to grab new growth opportunities then rely on the best services of jiMenu. It offers an online software solution that helps your restaurant in gaining a great position in the competitive world. It helps your business in identifying new growth opportunities thus helps you in emerging into new sectors and markets.